Arturo Peña works the counter on a Sunday morning at his family bakery in the Fruitvale. The story of the Peña family begins like the stories of many immigrants: On the Fourth of July in 1978, Ramon Peña, his wife, Eva, and their four young kids (Jorge, Ramon, Arturo, Maria) embarked on a journey from their hometown in Guadalajara, Mexico, to Oakland. Ramon had a dream, one of opening a bakery in the land of opportunity. Little did he know that, twenty years later, his bakery would become one of the most recognized Latino establishments in Oakland. Peña got his start as a baker in his native Mexico. Once in Oakland, he got the opportunity to perfect his craft out of La Borinqueña. By 1997, he had saved enough money to open Peña’s Bakery on 39th Avenue and International Boulevard. 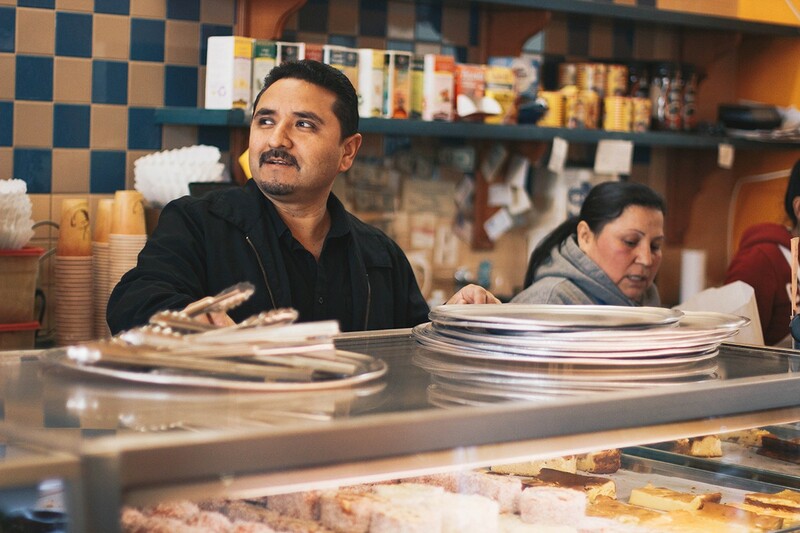 In 1998, his youngest son, Arturo, ventured out of La Borinqueña and opened a second location, and both bakeries were established in the heart of the Fruitvale District. Stepping foot into the bakery located at the corner of 34th Avenue and Foothill Boulevard feels like visiting one in a small town in Mexico. The smell of freshly baked treats entices the senses. The sight of the colorful and assorted display of pan dulce further captivates. You begin to wonder what bread to buy; the canasta, a small basket-shaped bread filled with custard, cheese, or jam; an empanada filled with pineapple or apple; or perhaps a concha, one of the most recognizable pan dulce of all. While it is an almost impossible task to choose, one thing is certain: Each piece was baked with the utmost love and dedication. After all, Peña’s Bakery remains a family-owned and operated business. Ramon and his daughters Maria and Eva are a fixture at the location on International. Arturo owns and operates the Foothill location. Arturo believes in being hands-on running the business. “When you expand too much, you lose the quality of the bread,” he explained. Another key to their success: the close relationship with the clientele. Since the early days at La Borinqueña, the family has seen their patrons grow from small kids to adults with their own children. They’ve been privy to joyful celebrations, as well as in mournful times. And their customers vary from day laborers grabbing a morning coffee and bread to families buying their weekly fix — and of course curious hipsters who have heard about the bakery through social media. While food trucks come and go, Sinaloa’s roots run deep. The Klan’s incompetent regime started crumbling right away.